This is a Recipe for Kashmiri Cauliflower Bhaji, which I have prepared in the normal method used by Kashmiri families to prepare this Main course vegetable dish. 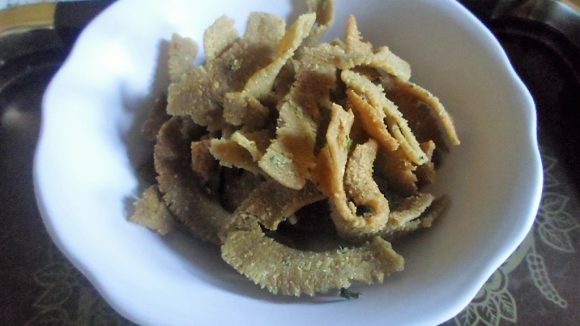 The recipe is given in a step-by-step manner to make the preparation easy and simple. 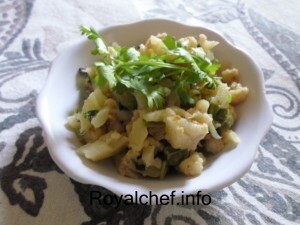 Also give below in the Marathi version recipe of the Kashmiri Style Cauliflower Sabzi. Boil the Water, add the Cauliflower, Green Peas and cook for five minutes, and then keep it aside. Heat the Oil in Kadhai and add the Cinnamon, Pepper Corn, Almond Paste and fry for two minutes on a slow flame. Then add the Green Chilies, Ginger, Coriander Seeds Powder and fry for a minute and then add the Salt, cook the Cauliflower, Lemon Juice for two-three minutes on a slow flame. Then add the Nutmeg Powder, Sugar, Saffron, and Coriander and mix it well and cook for two-three minutes on a slow flame. कृती : फ्लॉवर व मटर वाफवून घ्या. काढई मध्ये तेल गरम करून त्यामध्ये दालचीनी, लवंग, मिरे घालावे. मग त्यामध्ये बदाम पेस्ट घालून बदामी रंगावर कोरडी होईपरंत परतून घ्या. नंतर त्यामध्ये हिरवी मिरची, धने पावडर, आले परतून घ्या. परतून झाल्यावर फ्लॉवर, मटर, दही किंवा लिंबू रस, केसर, कोथंबीर, घालून एक सारखे हलवून घ्या. एक चांगली वाफ येऊ द्यावी.